Thank you for joining me as we count down to the next MFT release. We are five days away from the big day! All the new Stamps, Die-namics, and Stencils will be available on Tuesday, November 2 at 10:00 pm EST. Be sure to check out the MFT Blog to see all the new items being revealed today. Don't forget to leave a comment on the MFT Blog countdown posts, YOU could win one of the five $75.00 gift vouchers. I have a sweet little holiday card to share with you today. 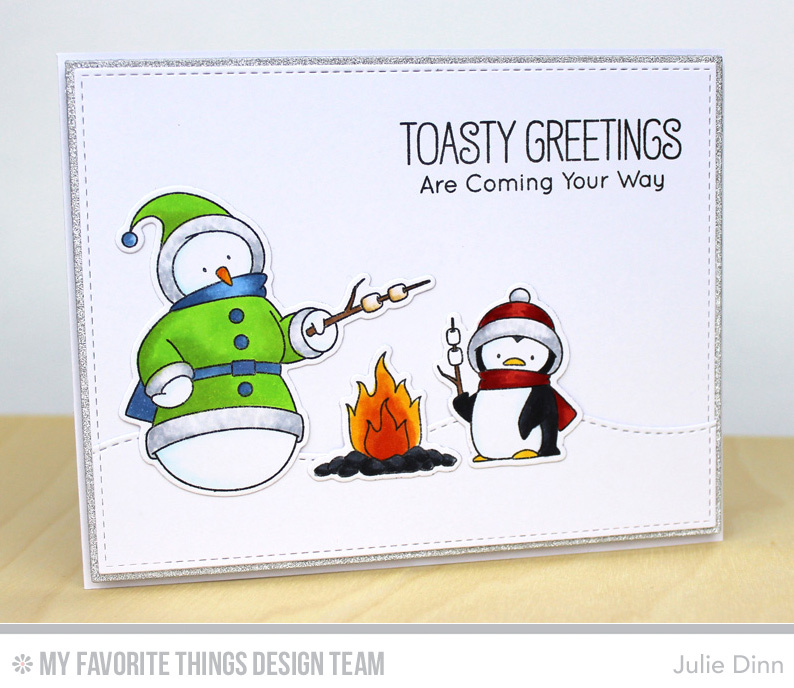 It features the new Toasty Greetings stamp set and Die-namics. The images in this set are over the top cute! I stamped the images with Black Licorice Hybrid Ink and I coloured them with Copics. I added a touch of sparkle to a few spots with the Wink of Stella pen. I love this set already!!! The little penguin gets me!!! You have made such a gorgeous card! Such a fun card - makes me wish I was camping! Such a sweet card and adorable set!!! Love it!! Beautiful card! Love the glittery silver border! Love this card! The penguin is so cute! What an adorable set! Lovely colouring on your card. Great colors and use of a white cards for snow! Love the new marshmallow theme. Such a cute winter scene. I love this card, the colors are awesome. I love how you used the die to create a snow ground back drop. Such a sweet card and adorable images! Fabulous coloring job! This is just darling! The silver sparkle is just perfect. I love your beautiful clean card, is super sweet!!!! Love those guys, so cute! Such an adorable card!! Just a snowman and penguin "chilling out" and roasting marshmallows. These two are so cute and what a fun card!! Love this super fun scene! Beautiful coloring! Super sweet! Love this card! Great job!